Although I intend on putting together a more intensive review of the 50mm 1.2, after I put it through its paces, I though it would be fun to write an initial post based on my first impressions of the lens. First of all the thing is beautiful, as we speak it is sitting on the desk bedside my computer and I can not stop staring at it. I feel like the creepy little teenager eyeballing his crush at the jr high dance, it's just that beauty. In the past I have shot with its big brother the 85 1.2 so I knew before purchasing it that the lens would be quality in regards to its build and feel. It is a tank, weighing in at almost a pound and a half, not something that would impressive the weight conscience mirrorless crowd but who asked them anyway eh? There is just something about the feeling of a beast of a lens that fits in the palm of your hand that makes my giggle, just a little. To pack that much high quality glass into such a small package is simply amazing. After a closer inspection of the front and back elements you really notice the quality and thickness of the glass that gives the lens its weight. The body of the lens is a sleek yet rugged looking metal that is wrapped with a rubber focussing ring. This ring is supple and moves very fluidly throughout the focusing range. Although the lens does not extend or retract through the focusing stages, it does move slightly inside the lens barrel therefore I will be purchasing a clear filter in the near future to help with added protection from the elements. I am not a huge proponent of uv filters but with glass like this I will be using one when I am out shooting outdoor adventure type stuff, where the elements can at times sneak up on me. I once filled my 17-40 f4 up with dust after shooting a heli take off and landing a number of times. Since then I have decided why not throw that extra protection on in times when it is needed. In a more controlled environment, like a portrait sessions or wedding, I will leave the filter in the bag because I really don't like putting a cheap piece of glass in front of $1600's worth of glass. Anyway, enough about my opinions on uv filters. The lens also comes with a nice stout hood and Canons signature velvety lens pouch. As far as my initial thoughts on the performance of the lens, I am giddy. The bokeh is drool worthy at 1.2 as well as at smaller apertures but honestly I bought this lens to shoot it wide open. I want that look that the 1.2 provides and in my opinion if you are going to shoot smaller than wide open you should just stick with the 1.8, because for $100 it is an incredible lens. I know, because that is what I upgraded from. On a full frame body shooting wide open you are bound to miss now and again, with a razor sharp DOF this is just something you just have to come to terms with. As far as the focusing goes it is relatively fast. 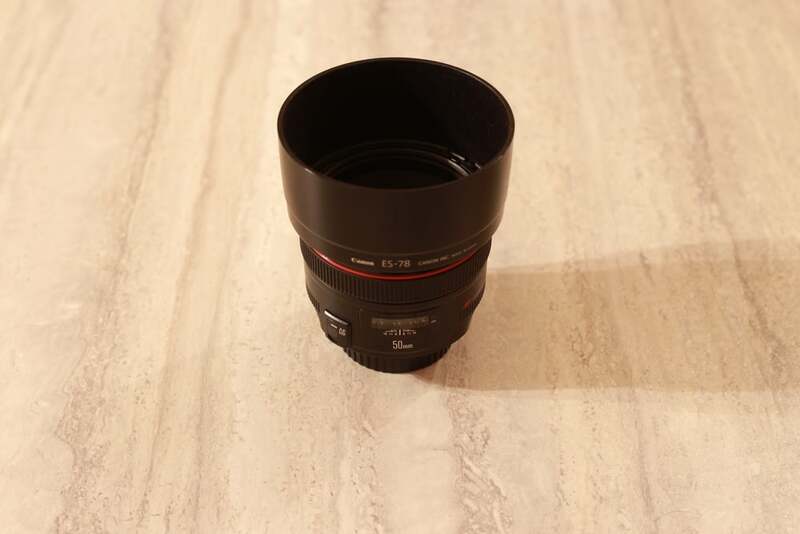 For such a fast lens it performs well. I can say for certain that it definitely out performs the 85mm 1.2 in the fast focus game. As far as my initial reaction to the lens I am super impressed. Great build quality, and so far no issues with performance. I am excited to get it out working for me and when I do I will put together a more meaty review. Trying to tell the story of the football play, I shot this as wide as I could. As a guy who predominantly shoots landscapes and nature photography I have found it hard to get out and shoot other genres. Although I have limited experience shooting sports, it is a style of photography that has always intrigued me. I recently got out and shot some high school football and I thought it would be helpful to write about what I learned form the experience. I know that the old saying is the best camera is the one in your hand but with a genre like sports photography there are some pieces of gear that are vital to success. First, a camera with a fast frame rate, I would say 6fps as a minimum but the faster the better. Second a long lens, I am not saying you need a 600mm lens to photograph sports, I use a 70-200, but a longer lens will help you get in tight on an athlete and fill the frame. I would also suggest a wide angle lens, they can come in handy when it comes to telling the story of the game. Guys like Scott Kelby do an amazing job of story telling in their images by getting that wide angle shot that shows the crowd cheering, or the disappointed coach after a defensive back blows his coverage. The most important thing about these lenses, in my opinion, is their speed. A lens that opens to f2.8 as opposed to f4, will allow more light therefore allowing you to shoot at a higher shutter speed. Because when it comes right down to it with sports photography, shutter speed trumps all. I think knowing the sport you're shooting is very important. If you know the game, you will be able to predict what is going to happen before it happens. I played football growing up so it is easier for me to practice my sports photography by shooting football. Although I have shot other sports in the past it is nice to be one step ahead, so you can comcentrate on things like camera settings and light. For the shot that I am providing in this post, I positioned myself where I knew there was the greatest potential to get a shot of a ball carrier making an interesting play. I stayed on the strong side of the field and I knew, that in this situation there was a good chance the offence would run the football. By doing this I was able to snap off about 40 frames of the ball carrier as he made his way towards me. The fact that he ran straight at me for 35 yards, facing me the entire time, was no coincidence. If you don't know a sport and you know you are going to be shooting it in the future, watch it on TV or research how to shoot it online. Heck, you can always emulate Scott Kelby the guy is a genius. I knew, that in this situation a run was very possible. One thing I find my self doing wrong often, when I shoot sports is that I try to follow the play or the team that I am interested in shooting. It seems that initially, I am pumped to be at this adrenaline filled event and that all the lessons of patience I have learned shooting wildlife and landscape have been forgotten. During this shoot, it took me about a quarter of the game to settle down and find a spot where I knew the action would come to me. I had to be patient and wait for the home team to get back on offence, instead of trying to move to shoot the away teams offence. After I did this I got a few keepers, until I did this not one shot was worth uploading to Lightroom. This tip has a lot more to do with shooting sports that are being naturally lit by the sun, as opposed to shooting football under stadium lights or indoor basketball. As photographers, the first thing we should do when we get to an outdoor location is consider the light and how we want to utilize it. In the case of the football game I wanted the players I was shooting to be front lit. By doing this I would be able to avoid harsh shadows, as well as make it easier for the camera to pick up more light, enabling me to shoot at higher shutter speeds. This again, much like tip #3 , can seem like a restriction to what you can shoot but I look at it from a different perspective. I consider it a good thing because it narrows down my options and allows me to focus on the spot of the football field where I know the images will look great. During the game, once I found a spot that worked I stayed put and waited for the action to come to me. Patience is key here, just as it is in many other genres of photography. I would much rather have a few great images than a bunch of junk. Head on a swivel. The light here allowed me to capture the detail in the players faces. Although I am not a huge fan of shooting jpeg, due to its lack of versatility in post-production, I have read about many professional sports and wildlife photographers that shoot in this format. The advantage here is that jpegs are smaller files that RAW files. Therefore the camera can write more images to a card before its buffer gets full. The dreaded buffer is always in the back of my mind when shooting wildlife, especially birds in flight. I do shoot RAW all the time though. I suppose it is because I am the obsessive compulsive type of nerd? The advantages of shooting jpeg, when shooting sports are defiantly real. For example, with the camera that I shoot wildlife and sports with, the Canon 70D, I can fire off between 17 to 19 RAW images in a burst before the buffer kicks in. This is weak compared to the 65 shots I can blast off without interruptions shooting jpeg! So, something to consider before you start firing off busts at your next sports shoot.